Day 7- Sail to Ucluelet on Friday night to get ready for transport back to Vancouver on the Saturday. Day 6-7- Make landfall at Hot Springs Cove and spend some time enjoying the Hot Springs before heading back to Ucluelet to catch our transport back to Vancouver. Day 2-3-4-5-6- Explore the West Coast and visit places such as Hot Springs Cove as well as several remote anchorages. 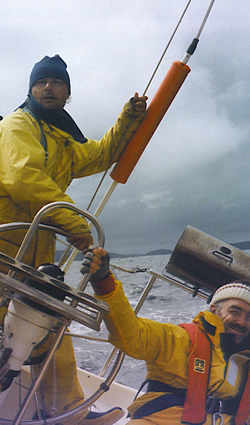 Practice using spinnakers and cruising chutes as well as applying advanced navigation skills (including radar & chart plotter, etc). We will also practice night time navigation skills and safety exercises. Day 7 Sail to Ucluelet on Friday night to get ready for transport back to Vancouver on the Saturday. 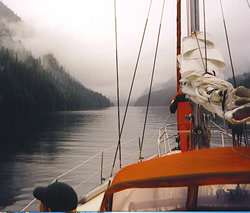 Day 5-6- Sail from Bamfield to Victoria and then on to the Gulf Islands which may be an overnight passage doing nighttime sailing & navigation and most importantly developing advanced seamanship skills. Day 7- Sail into Vancouver and get ready to depart the vessel on Saturday afternoon.